Richard A. O’Brien, holds a doctorate degree in Chemistry and worked in the chemical industry for fifteen years before switching careers. He now teaches Chemistry at the University of South Alabama in Mobile, Alabama. He and his wife Lisa have two boys, Bowe and Connor. Connor, or CJ, was born in Savannah, Georgia, with cerebral palsy and uses a wheelchair for transportation. In addition, CJ talks to everyone with an augmentative communication device. The idea of CJ and the Angel Kids was conceived back in 2006 while attending church and is the will of God. 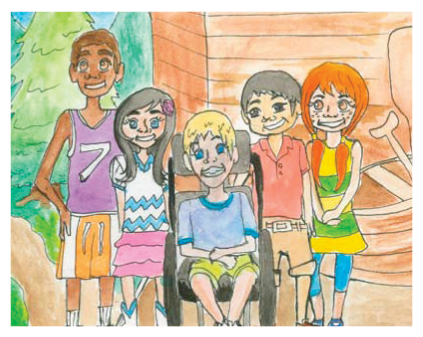 The book was written to teach all boys and girls how to interact with other kids with special abilities. All children with special abilities are still just kids and want to have fun playing with their peers. Dr. O’Brien is a native of Yankton, South Dakota, and currently resides in Mobile, Alabama, with his wife and two children. Andrea W. Pointer, M.S. is a certified and licensed speech-language pathologist with twenty years of experience working with children and their families in therapeutic learning environments. She co-founded Kids Kount Therapy Services, LLC in Daphne, Alabama, in 2008 with a primary mission to foster a sense of achievement within each child served and to help children discover their own unique potential. Kids Kount has since expanded to Mobile, Alabama; and Mrs. Pointer recognizes this growth as well as the opportunity to contribute to CJ and the Angel Kids as blessings from God. It is her prayer that the children and families that share in reading this book will learn to recognize the beauty and brilliance within EVERY child, particularly those children with special abilities. Mrs. Pointer is a native of Grove Hill, Alabama, and currently resides in Baldwin County with her husband Eric and their two children Breana and Walker. Shannon T. Norris, OTR/L is a certified and licensed occupational therapist with 14 years experience working with children and their families. She is the co-founder of Kids Kount Therapy Services, LLC in Daphne, Alabama, in 2008 with the mission of inspire all children to develop grace, courage, and confidence in themselves. Kids Kount has expanded to 2 counties in lower Alabama as well as multiple school based contracts. Mrs. Norris considers the privilege to contribute on CJ and the Angel Kids a gift from God and an answered prayer. “This opportunity to reach further than south Alabama to be the voice for children with dyslexia as well as other special abilities is a real dream come true. These kids have a lot to say and to teach us, if only we will listen. “ Shannon and her husband, Mike, have two girls, Brooklyn and Londyn, and Londyn is dyslexic. She is an extremely bright and a gifted artist. She also excels in science and continues to work hard at reading everyday. Mrs. Norris is a native of Columbus, Mississippi, and currently resides in Baldwin County with her husband and 2 children. Morgan Mabry lives in Wilmer, Alabama, with her parents and two siblings. Growing up, she always loved to draw and paint. She illustrated this book at age 16 while in her junior year at Mary G. Montgomery High School, wanting to support how important its message is and to show other kids that everyone has a unique talent that they can share with others. “Everyone in the world is different and should be proud of what makes them special;” this statement is something she strongly believes. One thing that makes Morgan special is her love of playing music whether it is on flute, trombone, or guitar. She also has an interest in books of all genres. Morgan Mabry lives in Wilmer, Alabama, with her parents and two siblings. Growing up, she always loved to draw and paint. She illustrated all six books of the CJ series while attending Mary G. Montgomery High School, wanting to support how important its message is and to show other kids that everyone has a unique talent that they can share with others. “Everyone in the world is different and should be proud of what makes them special;” this statement is something she strongly believes. One thing that makes Morgan special is her love of playing music whether it is on flute, trombone, or guitar. She also has an interest in books of all genres.